Oral-B has been successfully running the Smile India movement campaign since the last few years and in its fourth year the campaign is still going strong with new elements being added to the mix to keep the communication fresh. 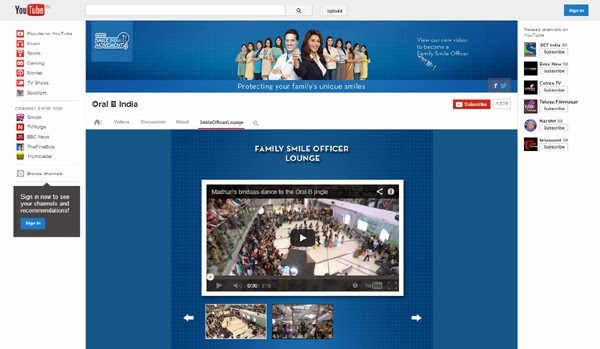 The latest is the (staged) flash mob video that has celebrity brand endorser, Madhuri Dixit, a.k.a. Chief Smile Officer, dancing in a mall to the new Oral-B jingle. The video is up on the Oral-B Youtube page in the ‘Smile Officer Lounge’ section and has clocked 1.6million+ views in less than 10 days. 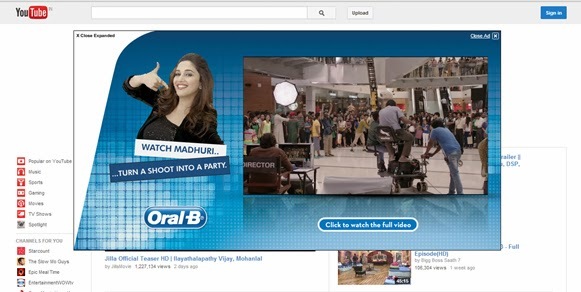 The brand page on Youtube also brings together Tweets and Oral-B Facebook posts. An expandable masthead on Youtube was used to drive users to the video on the launch day. This is a good initiative but I do have a couple of issues with the execution. The video seems a tad long, I lost interest after 2 minutes. The length of any branded video should be directly proportional to the content quality. A better jingle might have saved the day and would have even helped create a viral. The second issue is the badly written copy, if you don’t agree with me read the ‘About’ section on the video. Snapshot below.